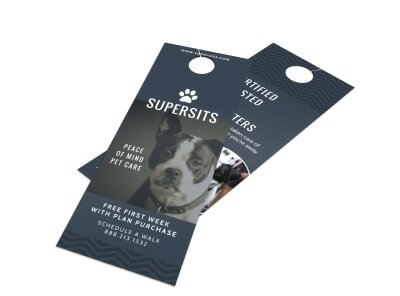 Give your dog-walking or pet-sitting business, grooming salon, vet clinic, or animal shelter a boost by covering your community with completely customized door hangers. 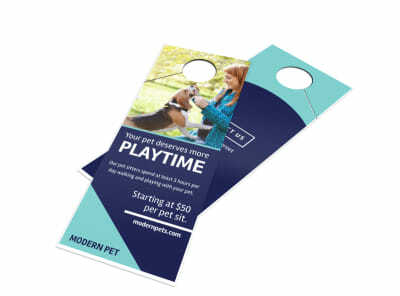 Encourage local equine enthusiasts to board their horses at your stable or recruit foster homes for your canine rescue organization – our pets & animals door hanger templates are at the ready. 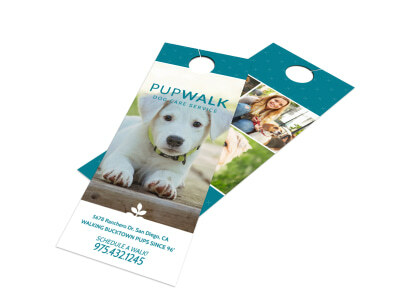 Use our design editor to craft a one-of-a-kind, memorable door hanger. Send it to your usual printer or throw us a bone in a dog-free game of fetch – we’ll print up a stack and deliver them right to your doorstep! 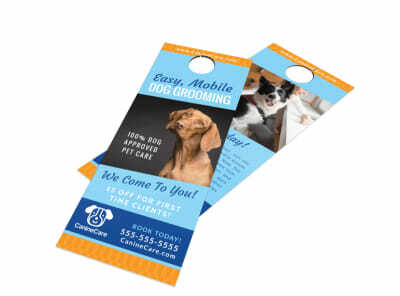 Multiply your dog grooming business’s marketing reach by papering your neighborhood with custom-designed door hangers that get the word out about who you are and what you have to offer. Show off your standard bathing and grooming packages along with a note about walk-in services (nails, teeth, ears). 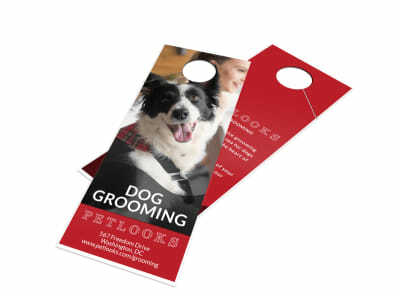 Begin by selecting one of our professionally-designed dog grooming door hanger templates, then add your logo and photos, update the color scheme, and select the perfect layout from within our online design editor. 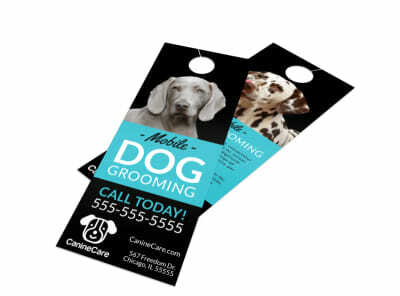 Give your finished door hanger a final once-over, then send it to the printer of your choice. Make sure to bring along a stack the next time you and your pup are out for a stroll – leave no door uncovered! 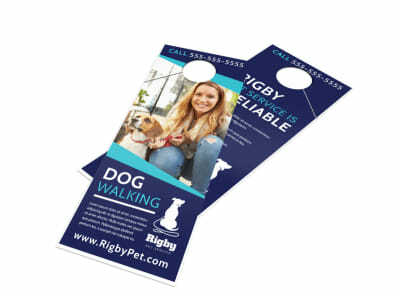 The next time you take Fido for a stroll through your neighborhood, spend the time to knock on a few doors to spread the word about your pet sitting business and hand out a custom-designed door hanger for every aperture, egress, entryway, portal, and postern you rap your knuckles on. 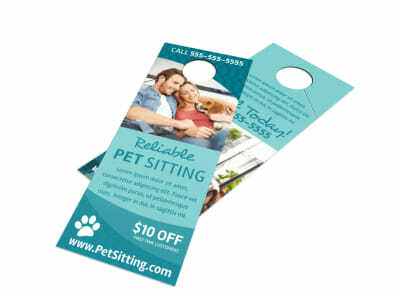 Busy pet parents can read about your pet sitting service on their own time when you use our online design editor to personalize one of our pet sitting door hanger templates. 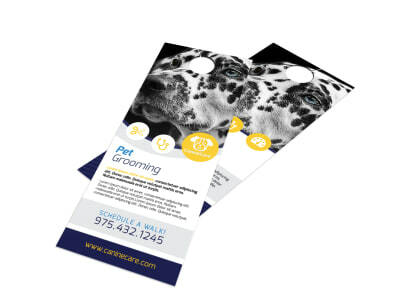 Capitalize on your pet expertise to construct the perfect combination of photos and buzzwords to get your service a second look. Your completed design can be sent to any printer you like, or you can have us whip up a stack and deliver them to you before the cows come home! 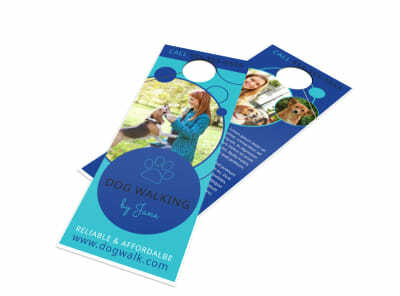 Let your daily stroll around the neighborhood do double-duty by carrying along a stack of door hangers that promote your dog walking business. 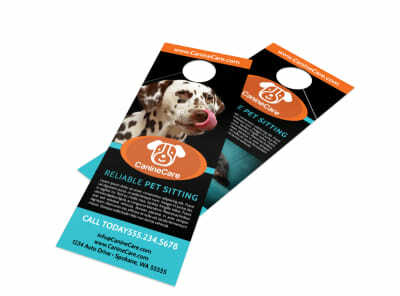 Go door-to-door and introduce yourself to the canine residents and their pet parents, leaving a door hanger with everyone you meet (and on the front door of those you don’t!). 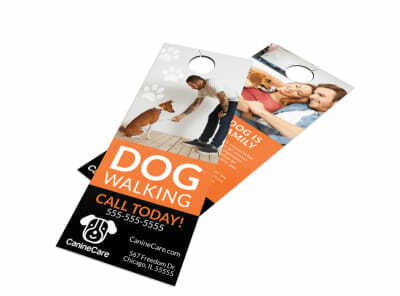 Our prolific professional designers are adept at creating customizable, pet-friendly dog walking door hanger templates. Choose the pick of the litter, then head over to our online design editor to personalize every aspect of the design. Include a photo or two that exemplifies your love for dogs, a basic pricing structure, and the best way to connect with you. 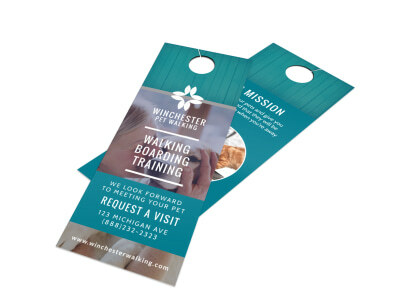 We can even save you a step by printing and delivering your door hangers right to you!